Families, do you struggle to cover the cost of out-of-school opportunities for your child? United Way of Western Connecticut’s ALICE® (Asset Limited, Income Constrained, Employed) Enrichment Fund will provide families who fall within the ALICE income category financial subsidies for their children to participate in extracurricular activities. The creation of the Fund is supported by research that shows that children who participate in youth sports (as one example) have improved levels of physical and mental health and academic achievement. Does your child want to play a sport, take an art class, enroll in music lessons, or something similar? We want to help your kids explore their interests and build skills outside of school. Qualified families can receive assistance for enrichment activities. Does my family qualify? Income thresholds vary by family size. For example, families of four can earn no more than $70,788 to qualify for this assistance. Contact one of our local partners today to apply! Click here to find out if your family qualifies. Click HERE to make a gift to support the ALICE Enrichment Fund. 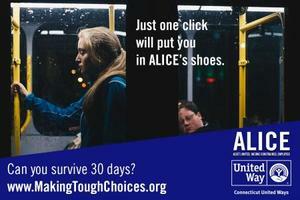 Visit Makingtoughchoices.org and put yourself in the shoes of a typical ALICE family.